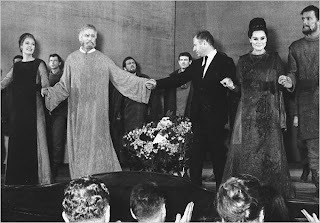 Brook (in suit), Scofield and co. take their bows for Lear. Moscow, 1964. I never saw Scofield gave a flashy, showy, unfelt performance; and his mixture of gravity and mischief transferred easily from stage to screen, as shown in his Oscar-winning performance as Sir Thomas More. But Scofield was more than a great actor. In his rigorous focus on the work in hand, his determination to protect his privacy and his mixture of classic and contemporary work, he was a reminder of an all-but-vanished age when actors preserved their sense of mystery. If Scofield revealed himself, it was through his work; and what we saw was a figure of rich humanity, wide-ranging compassion and unflinching integrity. "I know at least three playwrights who will tell you they realised they wanted to make their lives in theatre when they saw Paul Scofield play King Lear. It was ... the greatest classical performance of my lifetime: radical, humane and incredibly moving." I worked with him on the film of Arthur Miller's The Crucible; he never let on how he did it. He didn't really want to talk about it, apparently approaching the part through the way it sounded, though all the time probing it for secrets that were unknown even to its writer. He brought to Danforth, the hanging judge, the same deep spiritual conviction that he found in Sir Thomas More; and he was infinitely terrifying - much more frightening than he would have been if he'd played merely scary. There were two main reasons for his relative neglect, the first of which is a terrible comment on our honours system. He refused a knighthood, later telling me: “If you want a title what’s wrong with Mr?” Sadly, this meant that when people talked of our great actors, he tended to get forgotten or relegated below Derek Jacobi and Ben Kingsley. The other reason is that he didn’t want to be a household name, let alone a celeb. He seldom gave interviews and never appeared on chat shows, but lived modestly in Sussex, taking the local train to London when work demanded. It was the art, not the fame, that mattered to him. He was an extraordinary actor content to be an ordinary man. For those of us who missed him on stage, here's the man's complete filmography on IMDB. Some lesser gems: Bartleby, The Train, and even A Delicate Balance.